New Titles Coming to the Free Library in October! Yay October! Celebrate the end of soggy September with new titles that fit your need for fun or thrills this fall. 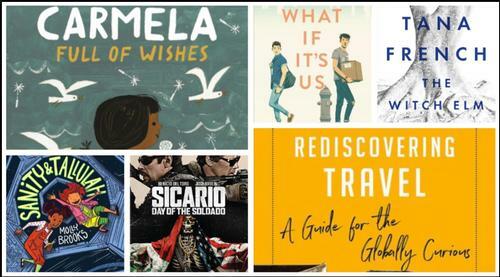 There’s sci-fi for kids, a teen love story, and for adults we have both thrillers and advice on putting fun back in travel—all at your neighborhood library! Sanity and Tallulah live in a space station at the end of the galaxy. When Sanity's illegally created three-headed kitten escapes, the girls have to turn their home upside down to find her. Check out this fun, quirky, sci-fi graphic novel! Arthur is only in New York for the summer, but if Broadway has taught him anything, it’s that the universe can deliver a show-stopping romance when you least expect it. Ben thinks the universe needs to mind its business. If the universe had his back, he wouldn’t be on his way to the post office carrying a box of his ex-boyfriend’s things. But when Arthur and Ben meet-cute at the post office, what exactly does the universe have in store for them? Maybe nothing. After all, they get separated. Maybe everything. After all, they get reunited. But what if they can’t quite nail a first date... or a second first date... or a third? What if Arthur tries too hard to make it work and Ben doesn’t try hard enough? What if life really isn’t like a Broadway play? Toby is a happy-go-lucky charmer who's dodged a scrape at work and is celebrating with friends when the night takes a turn that will change his life—he surprises two burglars who beat him and leave him for dead. Struggling to recover from his injuries, and beginning to understand that he might never be the same man again, he takes refuge at his family's ancestral home to care for his dying uncle Hugo. Then a skull is found in the trunk of an elm tree in the garden and as detectives close in, Toby is forced to face the possibility that his past may not be what he has always believed. A spellbinding standalone from one of the best suspense writers working today, The Witch Elm asks what we become, and what we're capable of, when we no longer know who we are. In this insightful and fun book, the former New York Times' "Frugal Traveler" columnist takes on the increasingly commercial and technological aspects of 21st-century travel. His advice will stimulate travelers' curiosity while rescuing a sense of adventure that has been eclipsed by technology and corporate tourism. The Sicario saga returns for a second raw, gritty glimpse into the deadly underworld of America's ongoing war with Mexican drug cartels. The drug war on the U.S.-Mexico border has escalated as the cartels have begun trafficking terrorists across the US border. A federal agent and an enigmatic former operative, whose family was murdered by a cartel kingpin, team up to battle an increasingly sophisticated and violent group of Mexican drug cartels. In order to inflame the conflict, the agents kidnap the cartel kingpin's daughter, attempting to turn the cartels against each in an every man for himself. all-out war. The plan backfires. When the smoke clears, who will be left standing in this heart-pounding, action-packed thrill ride? Check out these new titles and more coming to a neigborhood library location near you in October. Add a Comment to New Titles Coming to the Free Library in October!